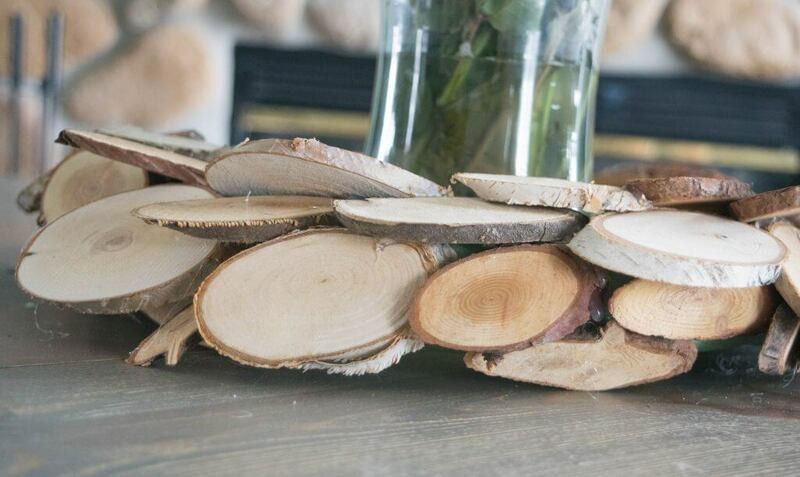 DIY wood wreath, perfect for every season! Do you ever have the need to get crafty? Some may enjoy a glass of wine, others go fishing, or for a run. I like to craft, crating things is my vice. 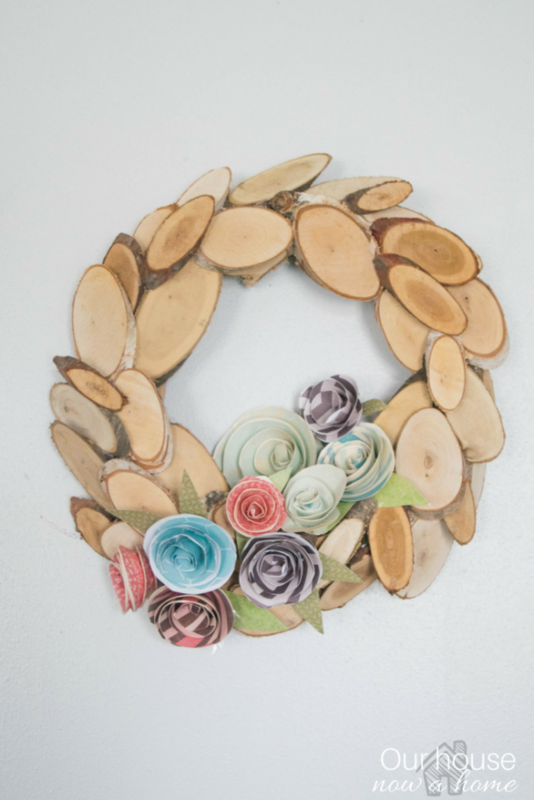 This DIY wood wreath, perfect for every season! It is just the kind of crafting I love. The best part is that it is actually really versatile. 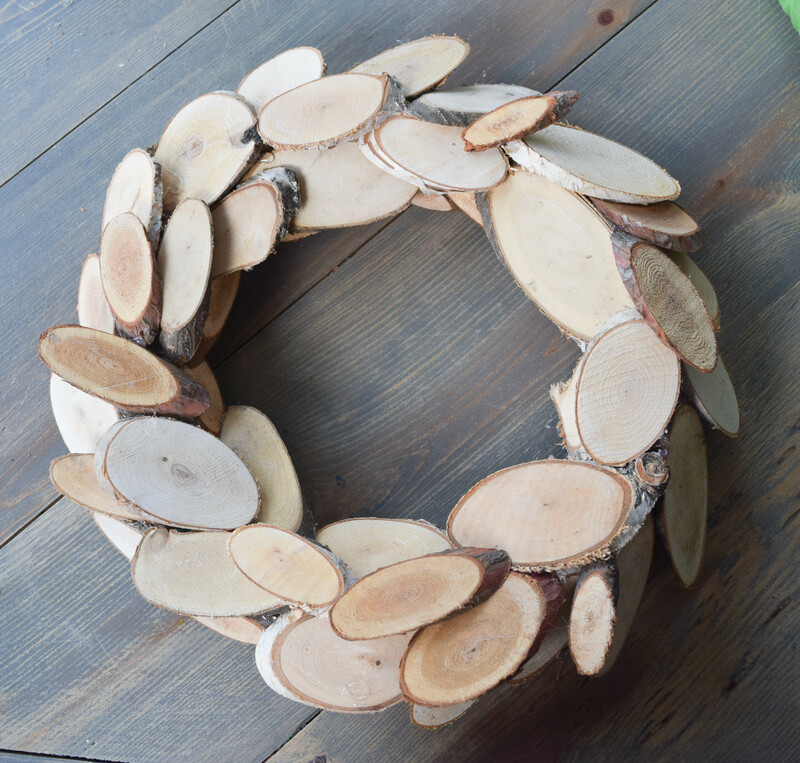 Since I made the wood wreath with only wood there leaves a lot of room for additions for every season or occasion. 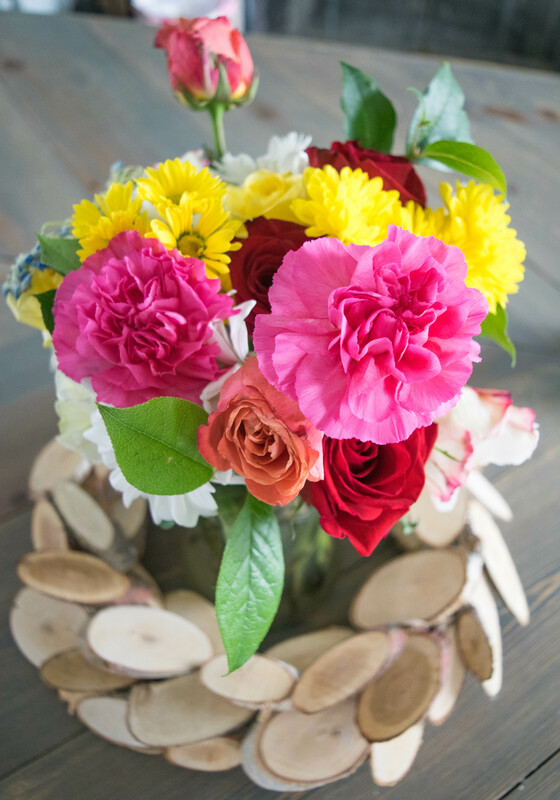 I have also fallen in love with using this wreath as a base for a centerpiece on the table. I will share a few different ways I use it after I share the steps to make this. I should mention that I am sharing a little sneak peek to some changes to my decor in my home. I will be sharing the full reveal in a home tour, my dining room is obviously by the fireplace which is very new. Just a little heads up on why it looks different. 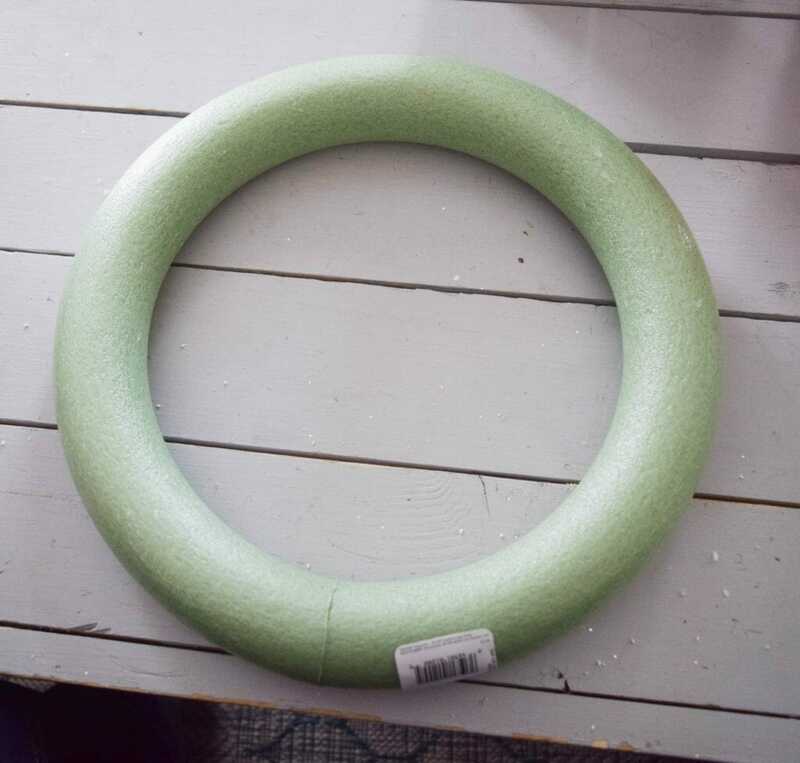 This standard round craft Styrofoam wreath is what I started with. 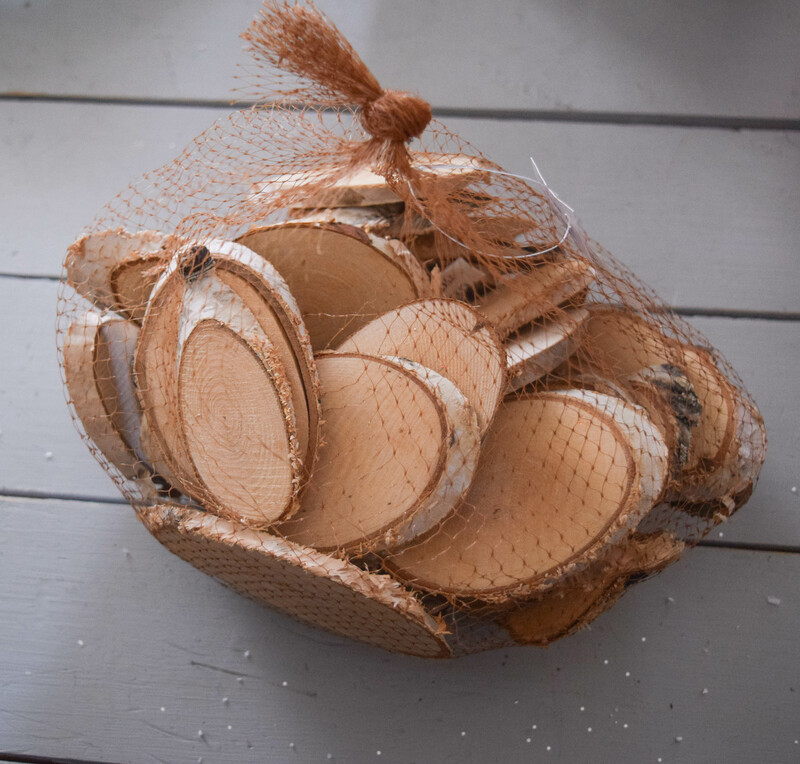 There is these bundles of birch bark that I instantly knew I wanted to use when I saw them in the store. I wanted to go rustic and simple for this wreath, allowing it to work all year long. I thought that these tree bark pieces would be the perfect way to make my overall look happen. I put this together by layering larger ones on top of each other in a staggered pattern. Using hot glue and attaching them to the wreath frame. I used smaller or medium sized birch bark pieces to fill in any holes to cover the wreath frame. I repeated this over and over again. It took me about 30 minutes to make this, it is not a difficult craft at all. 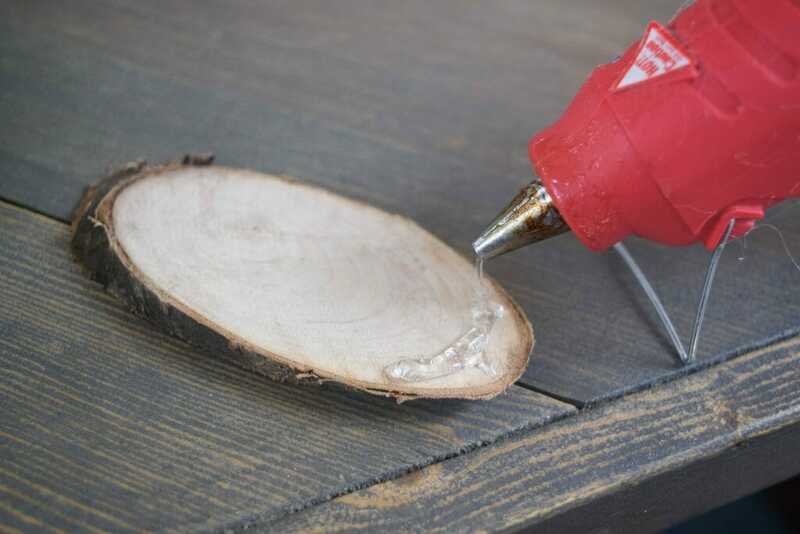 Layer in more than three in some spots in order to cover any holes. I think the best way to make this wreath a success is to play around with it. I would glue down a few pieces, then grab some more and place them in certain formations. Seeing if they would work together or if I needed to grab some other pieces before gluing them down. They came in varying sizes so I had a lot of options. 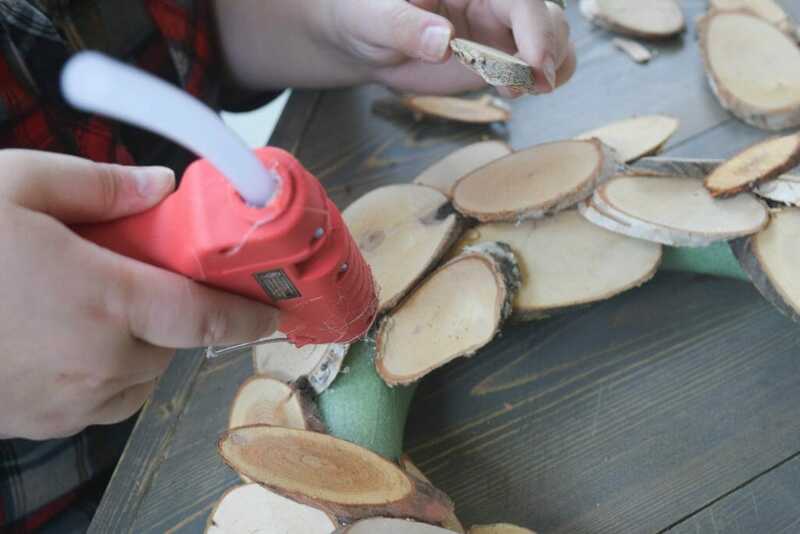 As you can see, this is the perfect example of making a hole between the tree bark pieces be covered up. Taking a similar sized piece and putting it in place. Once I got most of it covered I was able to go back and layer in ones that were needed. Don’t be attached to a strict formation with the tree bark pieces, there is no wrong way to do this if you are willing to make it work. 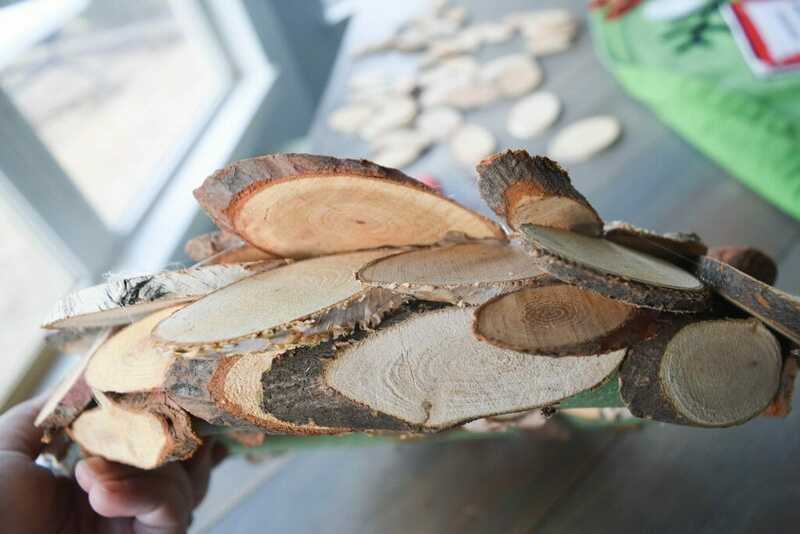 Change things around and use all of the sized birch bark. 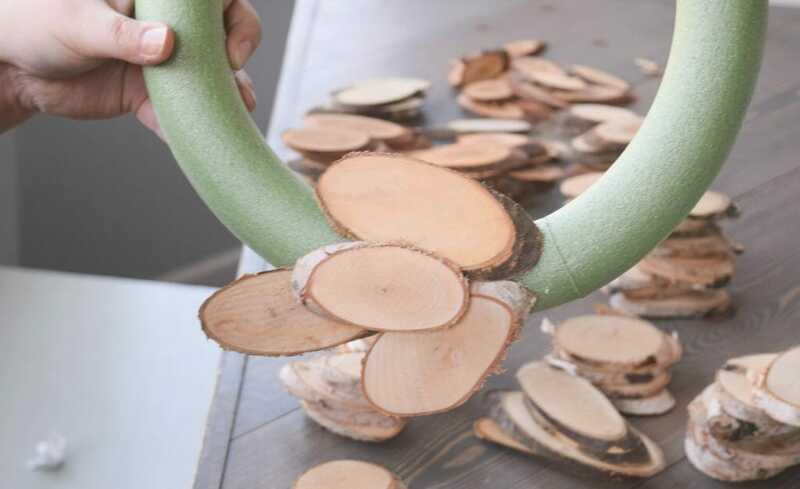 The DIY wood wreath was pretty much done, but then I noticed that there was still places that the wreath frame was seen on the inside and on the outside. Since this is going on a wall I needed to cover all of the spots. I did this with lining up any exposed edge with more tree bark. I actually only used two of these bags of birch bark, with about half of the second bag leftover for future craft project. It may look like I used a ton, but it was not too bad as far as supplies needed. Here you can easily see the line of birch bark on the outside of the wreath. This is just to have complete coverage of the wreath. I fell in love with the results! 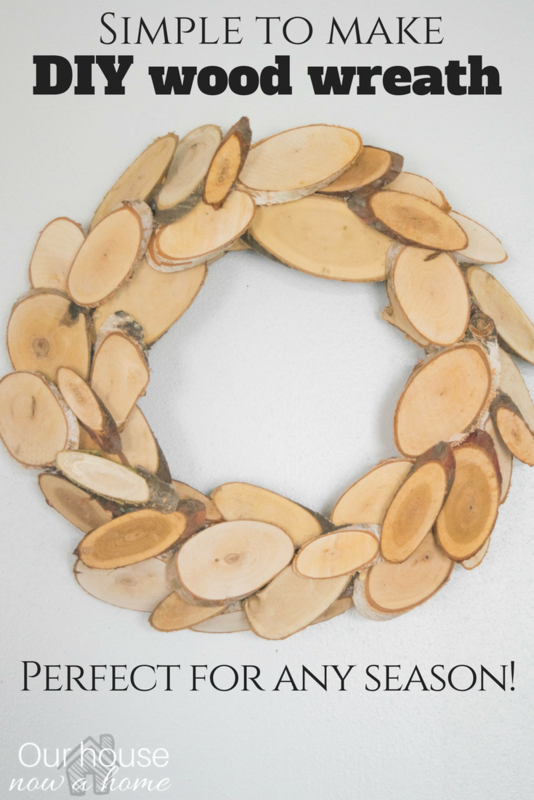 With the DIY wood wreath done I wanted to show all of the ways that this is perfect for every season! Leaving it as-is, with it’s simple and rustic elements is a great option. This allows the easiest way to make it work for every season, hang it on the wall and be done with it! Over the holidays I styled this same wreath for my Christmas fireplace mantel. It added a great nature element to my bold and red holiday decor. 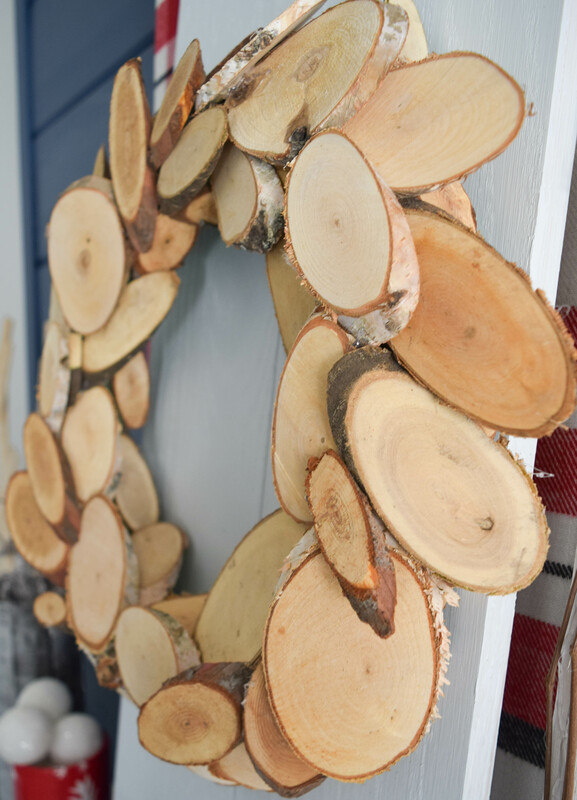 Now that we are heading into spring I thought it would be fun to see how this can become a perfectly Spring wreath. I even came up with two different and still simple options. The first keeping with the nature theme and using silk flowers, in this case tulips. Laying them into the wreath. 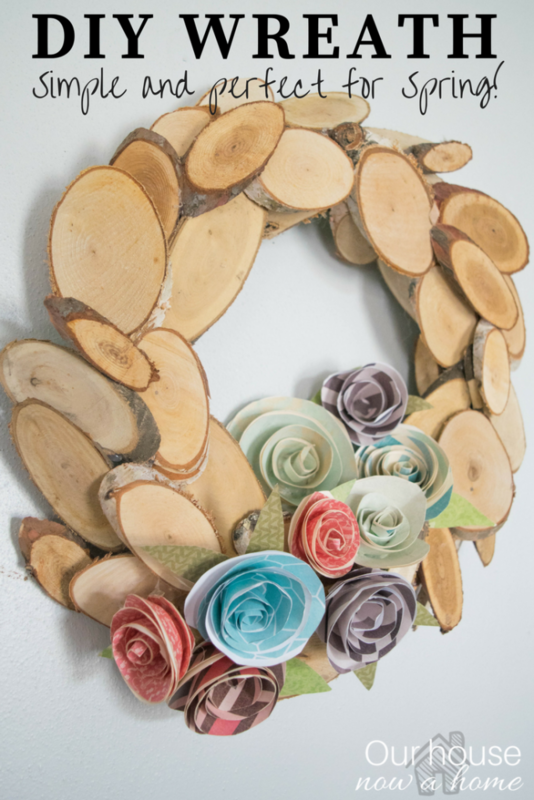 This softens up the rustic feel to the wreath without taking away the best quality which is all of the wood. Another easy to change out option is using paper flowers. I make a bunch of these all the time and sprinkle them throughout my home. 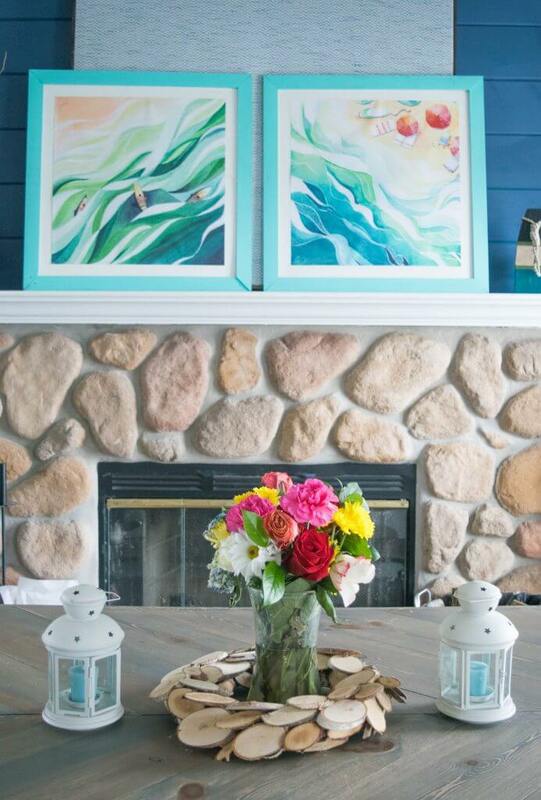 Sometimes they end up as a spring tablescape, sometimes they end up in a frame, and now they can work with a wreath. 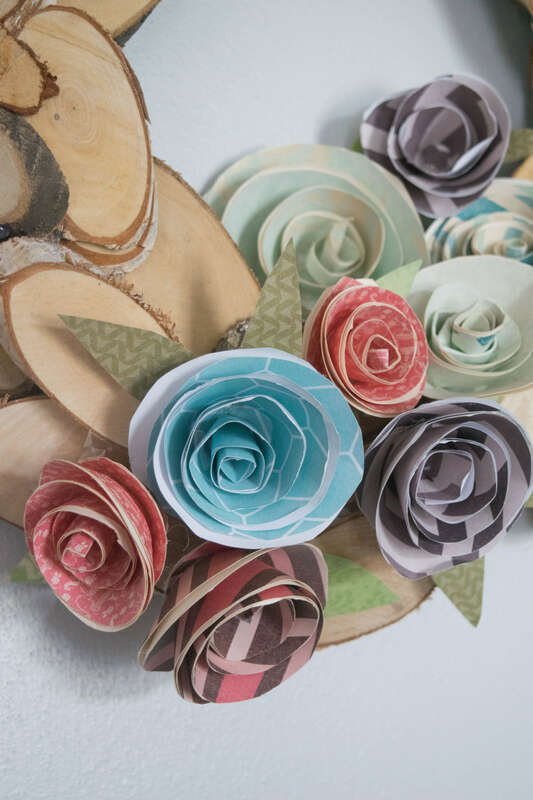 Layering in the paper flowers, giving a staggered appearance. 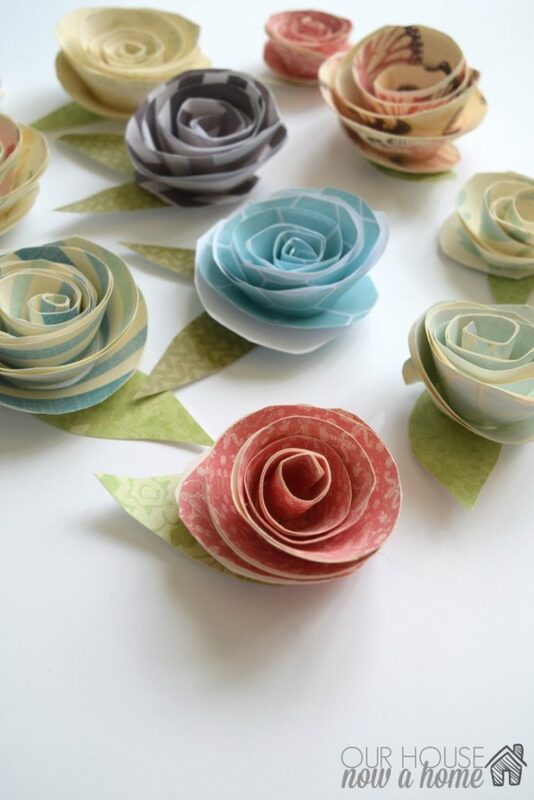 You can connect these flowers with tape, a small dot of hot glue or just wedging them into place. 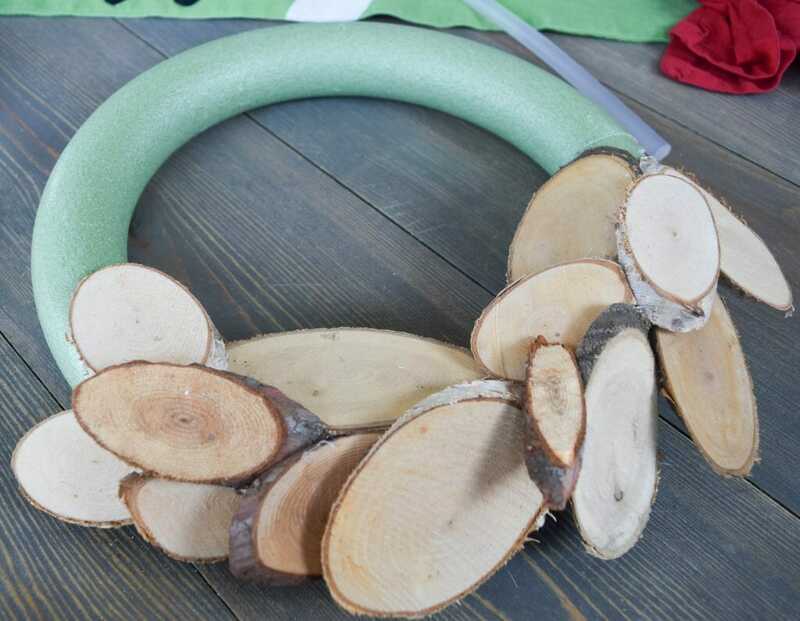 The key for this is to not put anything on this wreath that will become permanent, which would defeat the purpose of this DIY wood wreath, perfect for every season! I feel like I am going to sound like an infomercial person, “but wait, there’s more!! 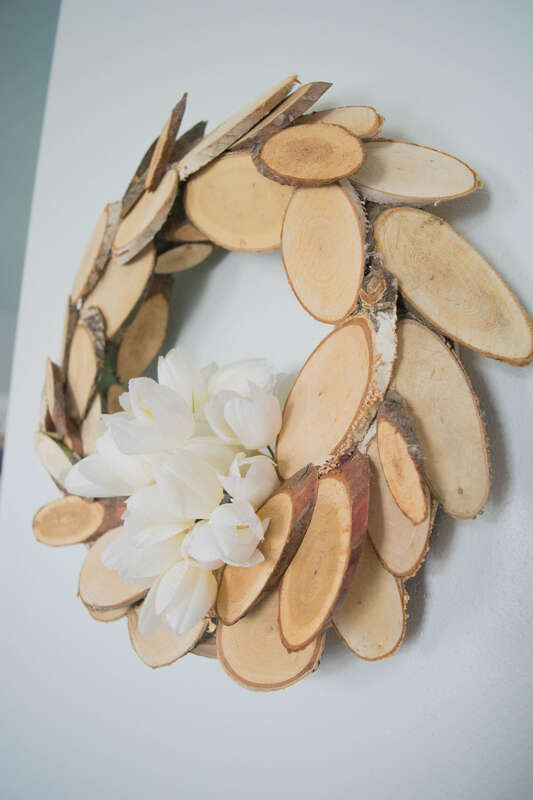 !” This little wood wreath has become such a cute little decor item in my home it can also be used as a centerpiece on the table. I am a sucker for fresh flowers, and Dale knows that the way to brighten my day is a beautiful bouquet of flowers. He brought these beauties home for me the other day. Surprise furniture change-up! I am so excited to reveal this update soon! They sat in the center of our table for a fay days, but they felt a little sparse. 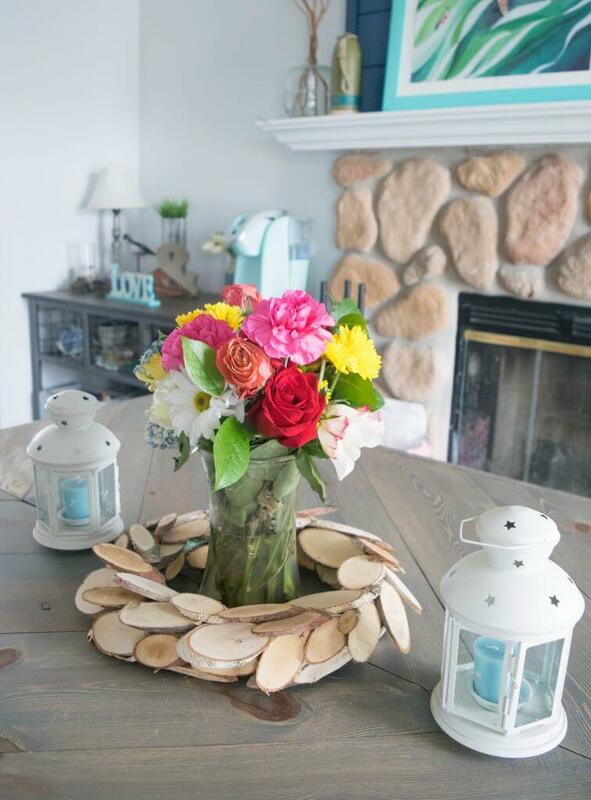 So grabbing this DIY wood wreath and having the flowers sit in the center of this brought a surprising style to my dining room table. 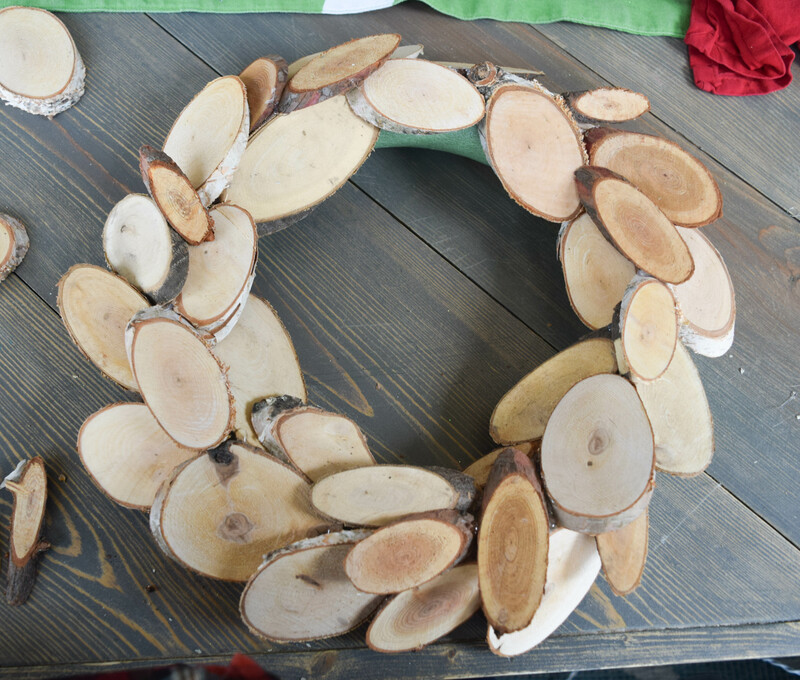 Wreaths actually make great centerpieces because of them being decorated from every angle. There is not “back” or “front” to them. Which means every sitting at the table gets the same pretty view. 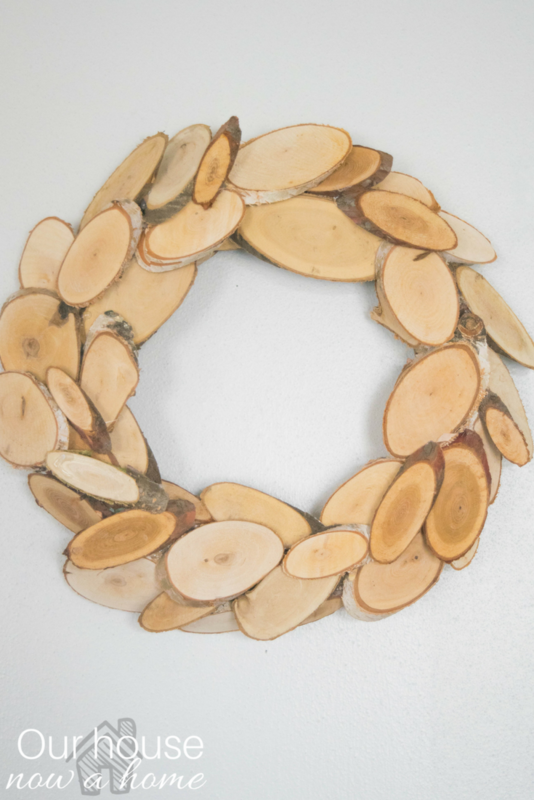 With just a few steps I was able to make this DIY wood wreath, perfect for every season. Changing out the smaller details, adding flowers is the sneaky way to make it work for spring. I will be sharing how I can update this for summer once that season rolls around. This can become a great example of how I am mindful of my decor, making it work to my advantage and be versatile enough for multiple seasons. Doing this allows me to decorate my home without having to spend a ton of money. Let me know if you have any other ideas on how I can add a little touch of spring to this DIY wreath. I am all for trying out some other ideas! I can share any new additions here in a new blog post or on social media. Let me know! That is SUCH a cool idea for a wreath! I have never seen one like that, but I LOVE how it came out! Super cute. I love how it looks and how versatile it can be. 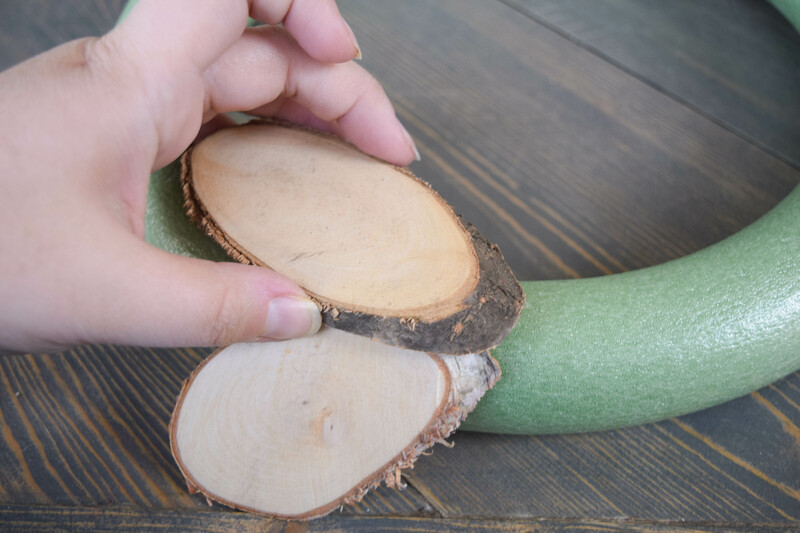 You can use it as a centerpiece or a decor for your front door! You can also choose to hang it on the wall. The rustic look is perfect for Spring! This is such a lovely wreath. I like the wood. I might have to make one of these for my daughter. It would be perfect for the front door. 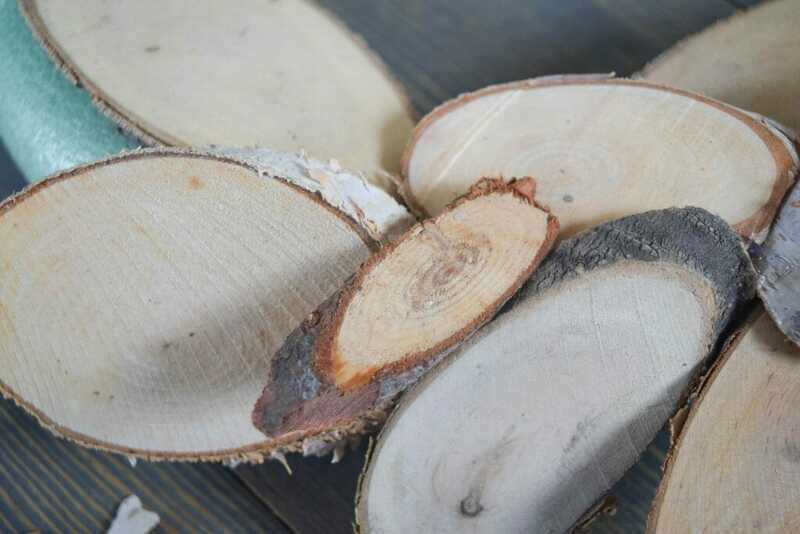 We heat our home with wood. Heck I have plenty of wood laying around, I could make this this weekend. Simple easy and no cost. What a cool wreath this is. I think that I need to try something like this to update my door for spring! That is such a neat idea. I’ve seen wood pieces like that and never knew what people did with them. I really like it with the flowers on the door. What a fun idea! I love natural decor like this. And you could ‘bling’ it up for whatever season you wanted. I like how you are using it in your table decor as well. What a super cute idea! I love that you can customize it for any season or holiday. 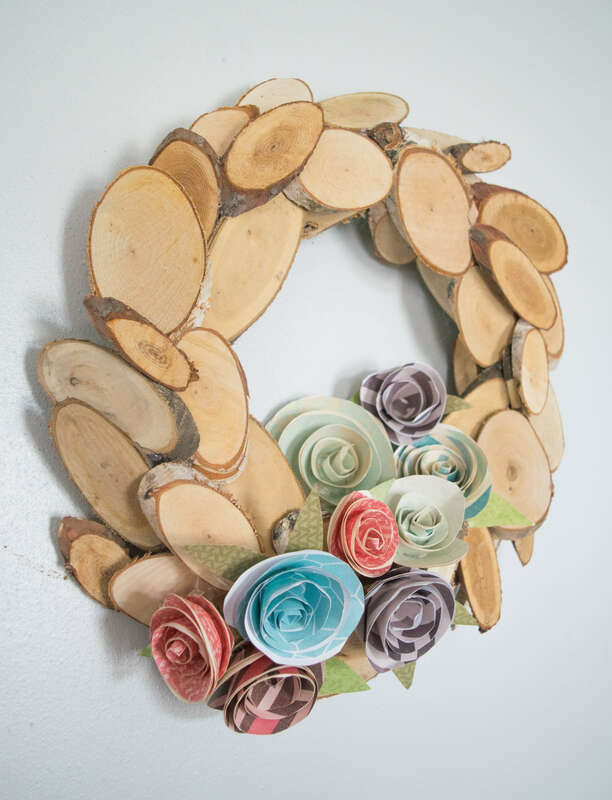 This is such a lovely wreath idea, there is something about cut wood used on items I really like and this is, of course, no exception. Oh that is really pretty! Lord knows I have plenty of scarp wood to do this! Oh I like this rustic look! I love how versatile you’ve made it too. That is so pretty! I love decorating things everything, especially with my youngest daughter. 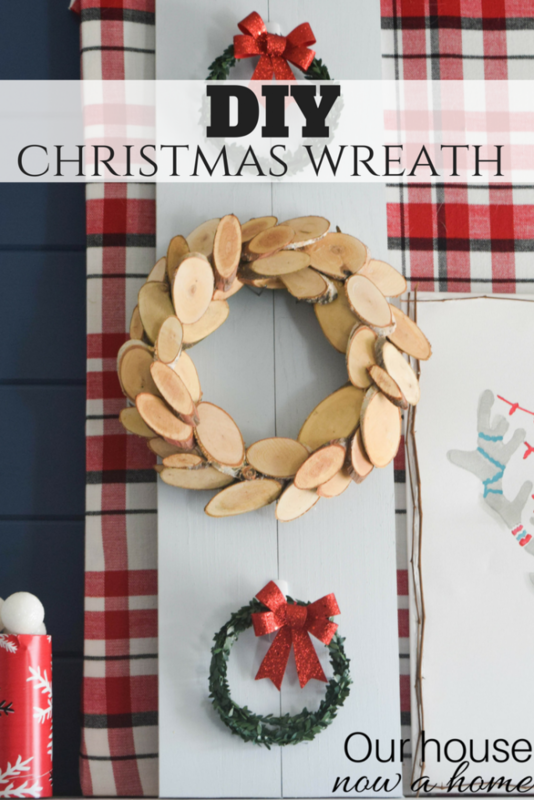 I love how you can personalize this wreath! Centerpiece or door wreath! Such a wonderful idea. 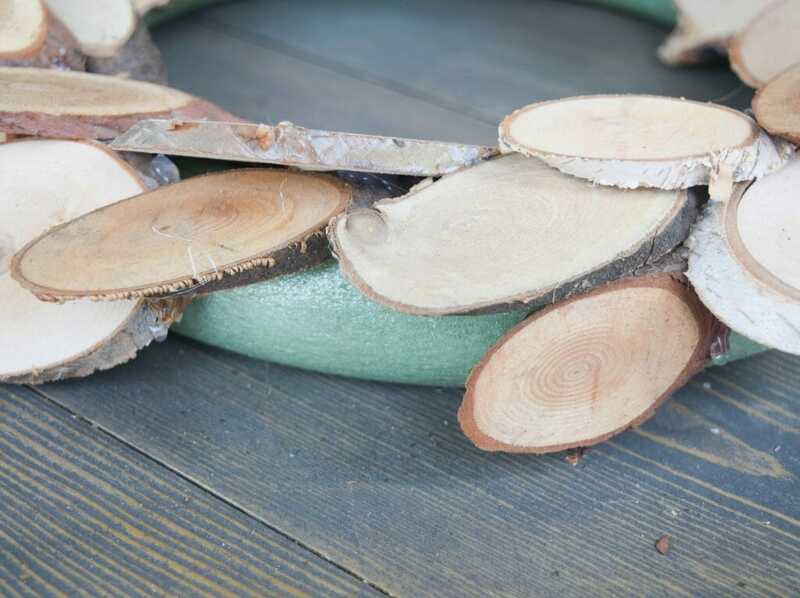 I love rustic decor and this DIY Wood Wreath looks so cute. I love how simple it is to make, too! I would totally try this one. I love how wild and textured it is! 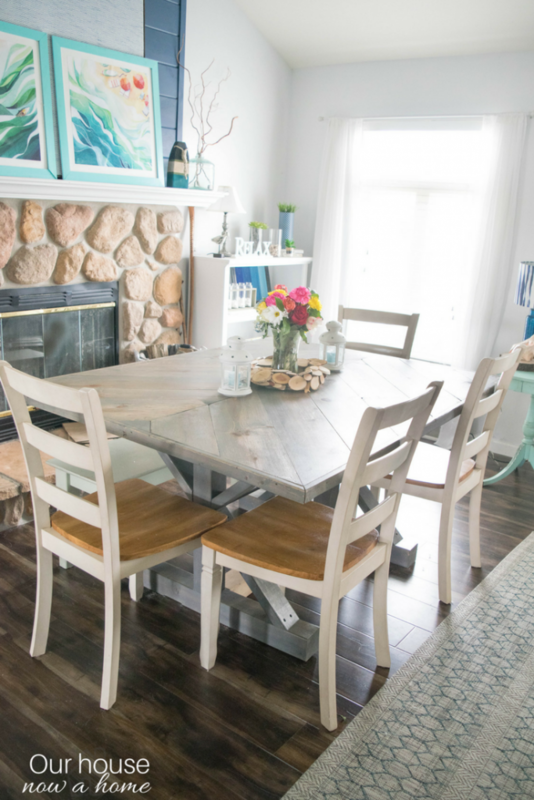 Your house looks gorgeous as always, I have serious table envy! I love the finished look of the wreath! This would be such a pretty transitional piece into Spring. I absolutely LOVE this wreath. 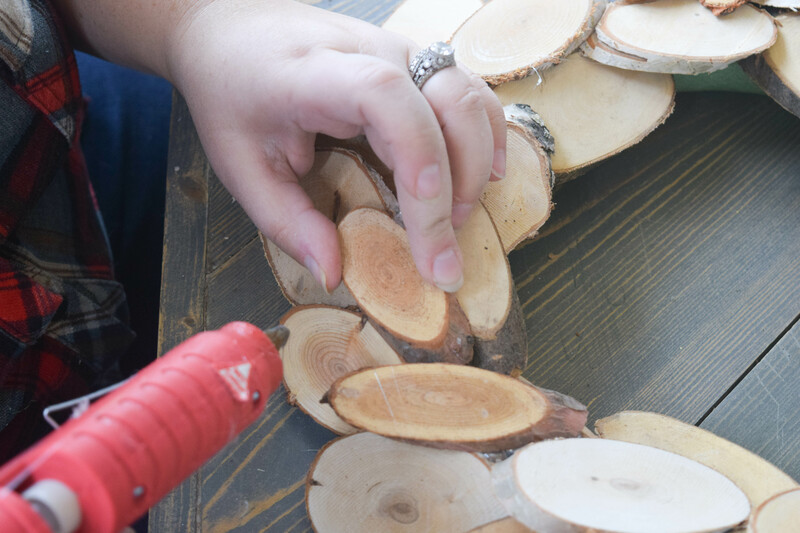 I am all about the natural and rustic look, and I especially love when I can make something myself instead of buying it from a big box store. Thanks for the inspiration! 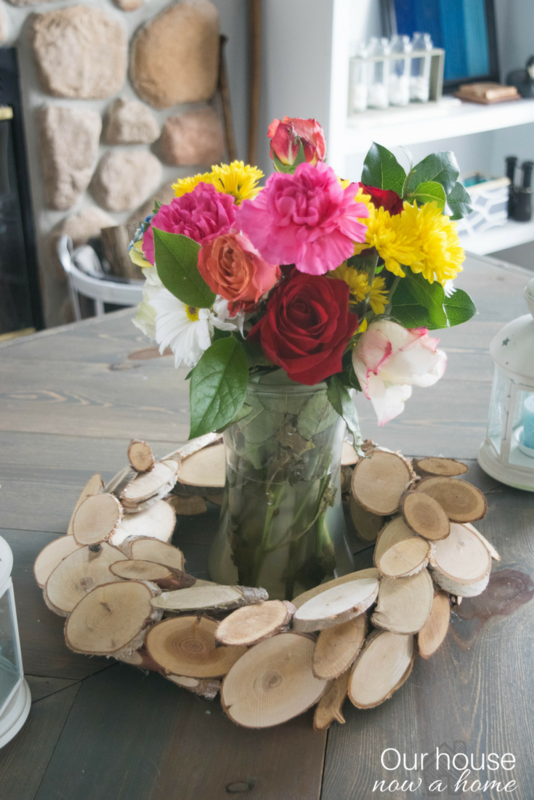 Talk about a lovely DIY project to make at home just in time for Spring! I think it’s beautiful and you can choose to have it as is or adds some decor or color. It’s really beautiful! 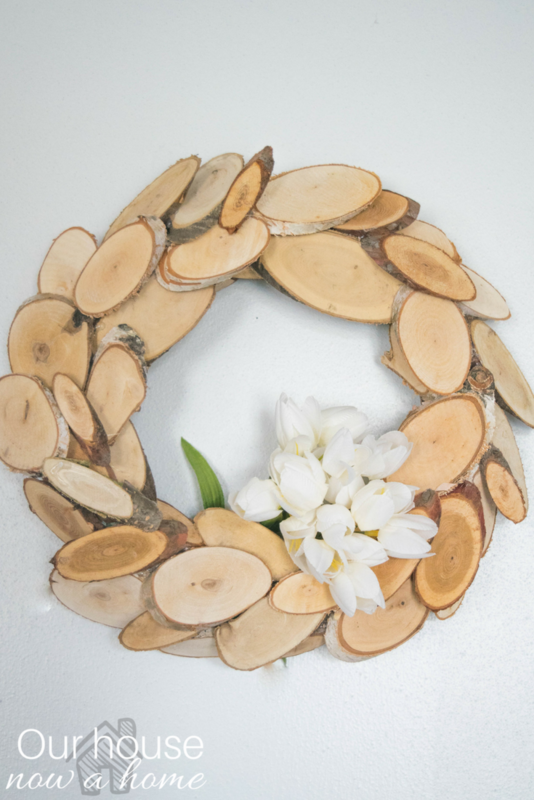 This wood wreath looks so lovely and natural. 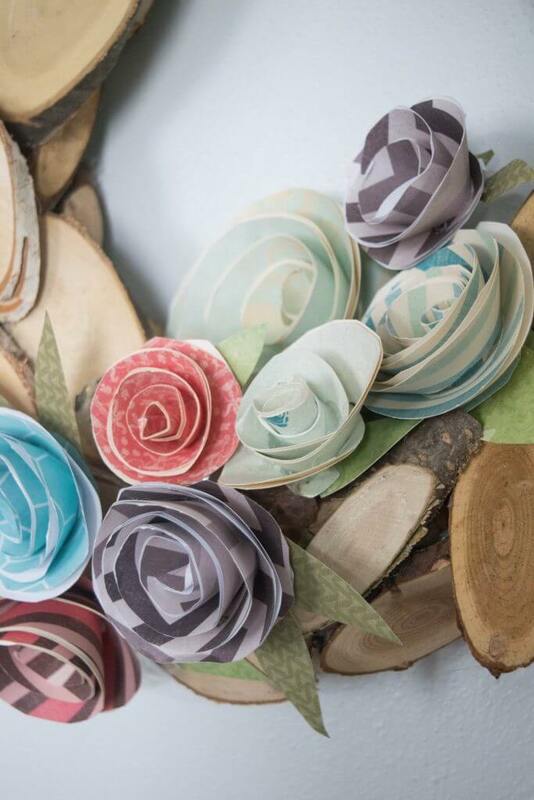 The natural colours of the wood blend so well with the flowers. Simple and yet elegant. This is absolutely gorgeous! I would love to do this for one of our craft day with my kids. I love making wreaths and this is a pretty unique one. What a fun idea! It’s definitely something I think I can make easily and those are my favorite kind of projects. I love this! I would stick moss in it. I think I might try this! What a simple project! I really like it flat around the vase but it’s so festive when you add seasonal decor to it! This is an amazing idea! I love how versatile the wreath is! I really love this wreath. The wood is just so pretty cut like that. I have lots in my backyard and I bet my nephew would cut it for me. It would look really great over my fireplace.